The 2017 MLS season opened with a bang over the weekend, ushering in a new era of professional soccer in Minnesota and Atlanta. Both clubs suffered Week 1 losses but return to the pitch this weekend in search of the franchise's first-ever victory. They'll play one another in a marquee matchup at Bobby Dodd Stadium on Sunday, but it will be the Galaxy who host this week's most expensive MLS game when they take on the Timbers at StubHub Center on Sunday. The Galaxy opened their season on the wrong end of the stick against FC Dallas, dropping a well-contested 2-1 match in their home opener over the weekend. They'll head right back to StubHub center this weekend when they play host to the Timbers on Sunday. As it stands now the average resale price for LA Galaxy tickets against the Timbers is $71. The cheapest available tickets start from $26 each. RFK Stadium was the hosting site of Sporting Kansas City's Week 1 match against D.C. United, which resulted in a draw. They'll open Children's Mercy Park on Saturday when they host FC Dallas, and it will be the second most expensive MLS match this week. Sporting KC tickets against FC Dallas currently average $66 with a get-in price of $35. The Earthquakes opened Avaya Stadium with a 1-0 win over the Impact last weekend, and the club will look to add another victory when they host the Whitecaps at home on Saturday. It will be the third priciest match to attend in MLS this week, with Earthquakes tickets at Avaya Stadium currently averaging $60 and the cheapest tickets listed from $23 each. A battle between the latest expansion teams will take place at TCF Bank Stadium this Sunday when Minnesota United FC takes on Atlanta United. 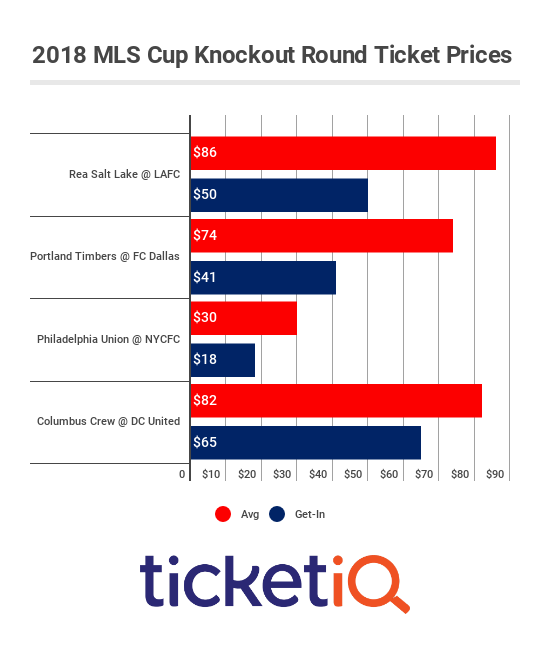 Despite both clubs losing out over the weekend, one will come away with their respective franchise's first MLS win, and Minnesota United FC tickets now own a resale average of $58 with a $32 get-in price. Rounding out this week's top MLS matches is a Dynamo-Crew SC matchup at BBVA Compass Stadium on Saturday. The Dynamo were victorious over the Sounders in their home opener and will look to add to the win column in their second straight affair at BBVA. As it stands now Dynamo vs. Crew SC tickets average $44 and the get-in price starts at just $12.